At Trinity the student experience is more than just a great education. From the moment you take your first step across the cobblestones you are becoming part of the University's 426 year history. 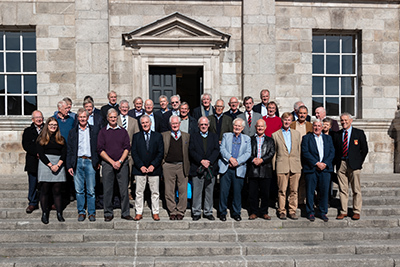 Trinity College Dublin alumni share memories from their student days at Trinity. 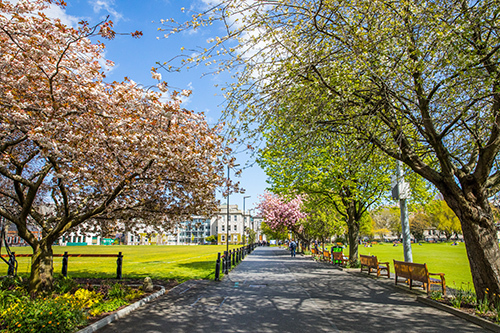 If you wish to share a Trinity memory with the Development & Alumni Office please contact us at alumni@tcd.ie or on +353 1 896 2088. I blame my membership of the Trinity Ball Committee for a 2.1 instead of a First. It was my final year doing a Mod. in Mental & Moral Science and I was a member of the Committee which brought the Ball onto campus. I represented D.U.H.A.C. as Brian Fisher ('Fish') did the Rowing Club, George Henry the Sailing Club and George Patrikious the Rugby Club. A feature of the night was that every member of the Committee and their partner had to present themselves to the Chairman of D.U.C.A.C. the redoubtable Rev. Professor (Dickie) Hartford; an unforgettable encounter with a legendary figure. I recall the Committee celebrated itself with a splendid dinner in the 'Bentley' in Molesworth Street, yesterday's equivalent of today's 'Chapter 2'. Somewhere I have a signed Menu. Races Day that Trinity Week was big time party time. After the events on the track we went indoors to celebrate. It all kicked-off with the Knights of the Campanile 'do' and thence downhill. The Boxing Club party in the Rubrics was a case in point; a splendid Summer Punch graced the occasion, the considerable 40% proof content was, of course, diluted. …with rough cider. You may imagine the result. Later on, myself and my partner Hazel Macnamara, who was to become my wife, joined George Henry and his partner Hilary Barton (who was to become his wife) at their table in the Royal St. George Yacht Club for the D.U. Sailing Club Dinner Dance. Mind you, the time between the D.U.B.C. event and the Dinner Dance is a trifle blurred: apparently we drove there somewhat circuitously. I wonder, in my elderly way if any of the old gang are still with us? My days in Trinity were amongst the happiest of my life, I will always remember.. The Chemistry Departments on the island got together once a year at the Research Students Colloquium. 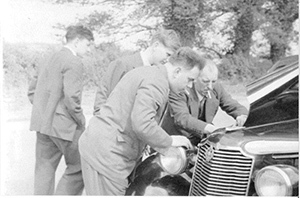 In 1954, it was held in Galway and Professor Cocker offered a lift to four research - they would now be called - graduate' - students. The Professor had left his car in for servicing the day before, but they had not sealed the radiator properly. It required addition of water every so often. In those days, every village had a public water pump on the street and these proved a godsend. I gave a talk at the Colloquium. Professor Cocker had been instrumental in getting an Infrared Spectrometer for College, the first in the republic, though Queens may have had one. I reported some of the first results from the machine. Two events involving Dublin University FC still linger in my memory. 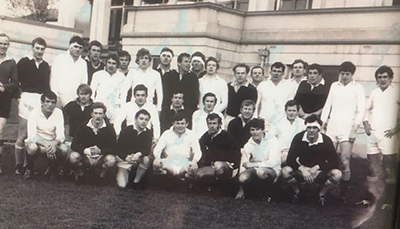 The first was the Annual Colours match between Trinity and UCD, on 19 November 1967, and the second the match between a combined Trinity/UCD team and a combined Oxford/Cambridge team, in College Park on 9th February 1969. Trinity had lost the Colours matches of 1964, 1965 and 1966. A Trinity win was duly delivered in 1967 in the most dramatic of circumstances and after what was considered by sports commentators as one of the best, ever Colours matches. The Irish Independent in its end of year review rated it as the rugby highlight of 1967: "Inter-varsity rugby is famous for the unflinching, uncompromising spirit of its participants but seldom can students have provided such wonderful entertainment as at Lansdowne Road yesterday." With a moderate wind in the first half, Trinity dominated the early proceedings and it looked unlikely that UCD could get back into the match. Gerry Murphy had scored a penalty goal in the second minute, followed by a drop goal by Billy McCombe after 15 minutes. Rob Davies and Mike Sheridan controlled the lineouts for Trinity and for long stretches UCD simply could not get possession of the ball. Just before half time Tom Grace appeared to turn the tide, with what was to become a ‘trademark’ of his play, namely in full flight kicking over Gerry Murphy, the Trinity fullback, and at pace gathering and diving over for a ‘sparkling gem’ of a try. However, ten minutes into the second half, all seemed lost for UCD, when Chris Hawkesworth scored a splendid individual blind-side try for Trinity. But, the tide turned UCD's way again and they controlled the game but into injury time there was to be a final twist. Tony Hickie, the UCD fullback and father of former Irish international Denis Hickie, was taken off injured. The wily Trinity fly half Billy McCombe exploited this turn of events with one of his speciality 'Garryowens' into the UCD ‘25’ and from the ensuing Trinity scrum dropped a goal. Trinity had won 12-11. Oxford/Cambridge v Trinity/UCD, College Park Feb 1969: (Whites), back row, Gordon Davies (Wales), Billy McCoombe (Ireland), Fergus Slattery (Ireland and Lions), Ernie HIpwell, John O’Hagan, Tom Feighery (Ireland), Con Feighery (Ireland), Tom Grace (Ireland captain and Lions), Shay Deering (Ireland captain). Front row. Chris Hawkesworth, Peter Sutherland, Frank O’Driscoll (Ireland B), Gerry Murphy (Ireland coach), D.P. Donovan, Frank Keane. (to left of Frank in dark jersey, Chris Laidlaw (NZ captain and scrum half). These academic, College, country and religious ‘differences’ though were all cast aside just over a year later, when Trinity and UCD combined to take on the 'might' of a combined Oxford/Cambridge team, at College Park on a very cold Friday afternoon in February 1969. The big attraction was Chris Laidlaw, the New Zealand scrum half and probably the best in the world then. Trinity/UCD won though by 25-6, even if must be admitted, reluctantly, that some key players were missing from the Oxbridge side. This was a remarkable Trinity/UCD side. Six of the fifteen played or went on to play for Ireland (two more for Ireland B); Shay Deering, Tom Grace (Lions) and Fergus Slattery (Lions) all captained the Irish side, with Con Feighery, Tom Feighery and Billy McCombe (Trinity) making up the remainder. Besides, the Trinity second-row forward Mike Roberts played for Wales, as did Rob Davies, and the Lions. Later that year, on a broiling May afternoon in Paris, many of us played again, for the Irish Universities against the French Army. We were beaten in the seventh minute of injury time, but this mattered little compared to the broken leg that Frank Keane (Trinity) sustained in this match. It was my last rugby match as a university student and less than a year later I had to give up rugby altogether. My heart belongs to Trinity because I fell in love there, so many times. Every cobblestone, damp with lovers’ tears and each secret archway, rich with stolen kisses, retain my undying affections. When I fell in love there for the last time, my wife and I were blessed with our first child while still students in Trinity. Remarkably, all three of our love children would go on to become students there themselves. Indeed two of them found love there too, in their turn. Trinity, gotta love it! My abiding memory is sitting in Brendan Kennelly's English lectures. I remember clearly his beautiful voice with the hush of music in it, his inspirational words, his pleasure in imparting his wisdom to students .You just wanted to read for yourself what he urged you to read and drama and literature opened new magical pathways for you. Returning last Autumn to an alumni reunion I was freshly struck by its wonderful students who ably led us and the fine talks given by students and academics. I love Trinity - much has changed, it's busier, but its great beauty endures.